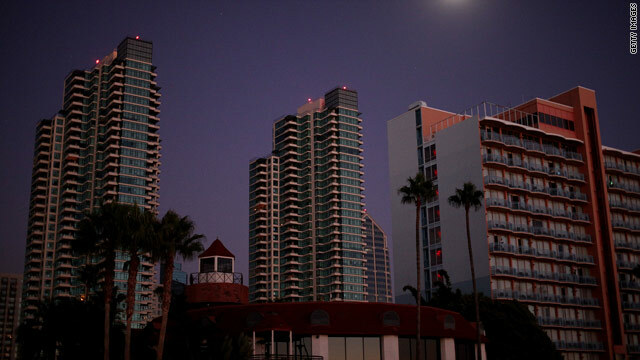 Downtown San Diego was dark Thursday evening from a power outage that affected 5 million Californians. [Updated at 8:02 a.m ET] San Diego Gas and Electric Company says it has restored power to all 1.4 million customers in its service area affected by a massive power outage that began Thursday afternoon. [Updated at 6:56 a.m. ET] By early Friday morning, power had been restored to 710,000 consumers in San Diego County, the utility said. Power was back on late Thursday for consumers in Arizona and California's Orange and Imperial counties. Millions, though, were still without power. [Posted at 5:42 a.m. ET] The California ISO, the state's power grid operator, says nearly 5 million people in San Diego, Orange and Imperial counties may have been affected by the power outage. The number is an estimate of the average number of people living in households in the region that were without power at the height of the blackout. The total includes San Diego Gas & Electric's estimated 1.4 million customers, or 3.5 million people, who were without power at the height of the outage. About 20,000 consumers, or 60,000 people, in Orange County and another 150,000 consumers, or 450,000 people, in Imperial County were without power. The total does not include those in Arizona or Mexico who were without power. This afternoon there were 4 helicopters (one was a very large Flying Crane helicopter) flying circles over the navy base at 32nd Street, San Diego. This activity went on for almost an hour and did not look to be routine. How much would the fuel cost for this? Why would they fly in large circles for almost an hour? Has everyone every similar activity? Could there be more to this story?